Duty of Agent to Principal. The Law of Agency deals with the status of a person (known as the agent) acting by direction of another (the principal), and thereby legally binding the principal in his connection with a third person. The person who binds a principal in this manner is his agent, known in Jewish law as sheluaḥ or sheliaḥ (one that is sent): the relation of the former to the latter is known as agency (sheliḥut). The general principle is enunciated thus: A man's agent is like himself (Ḳid. 41b). 1. 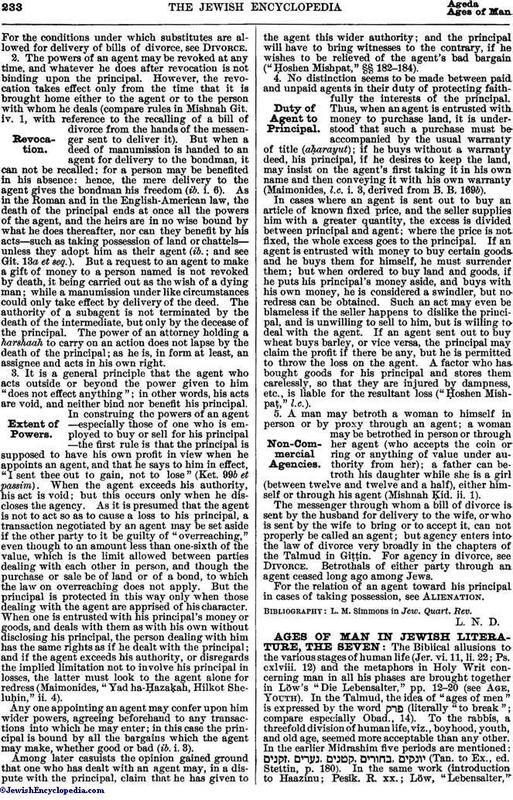 Under the Jewish law an agent may be appointed without the formality of writing, that is, by spoken words; and witnesses are not needed to give effect to these words, except to prove, in case of dispute, that authority had been given, and the extent of such authority. The standard authorities draw this conclusion from the remark in Ḳiddushin, 65b, that witnesses are needed only to meet denials. A woman as well as a man, and even a married woman, or the "Canaanite bondman" or bond-woman of an Israelite, may be an agent and bind the principal, sholeaḥ (sender), or ba'al ha-bayit (master of the house). A deaf-mute, a person of unsound mind, or an infant (a boy under thirteen or a girl under twelve years of age) can not be an agent, being deemed deficient in reason (based on Mishnah B. Ḳ. vi. 4); but such a one may act as messenger to carry money or goods to the party in interest by his express consent. In no case is a Gentile recognized as the agent of an Israelite, either to bind him or to acquire anything for his benefit; and a bondman, not subject to the marriage laws, cannot qualify as the agent of a married woman to accept a bill of divorce for her (Ḳid. 41b, Giṭ. 23b). An infant in the legal sense can not appoint an agent, even for acts for which he would be competent in person; thus, an infant wife can not depute one to receive her bill of divorce (Giṭ. vi. 3). A paid agent—that is, a factor or broker (sirsur)—does not differ from the unpaid agent in the relations which he can establish between his principal and a third person. One who wishes to authorize another to bring an action for him to recover money, land, or goods must make out a writing known as (letter of attorney), which in form is a transfer of the claim or of the thing to be sued for. It must contain such words as: "Go to law, win, and get for thyself" (B. Ḳ. 70a); otherwise the defendant need not recognize the attorney as a proper party to the litigation. The Talmud refers to these letters of attorney only in cases where the return of a deposit is to be demanded. Maimonides ("Hilkot Sheluḥin," iii. 2, based on B. Ḳ. 70a) holds that the transfer of an aliquot part of the claim is enough to give to the attorney a standing in court; for a part owner may sue on behalf of himself and companions. This view is accepted by later casuists. An agent may appoint a subagent (Ḳid. 41a); but under the Roman, as well as under the English-American law, he can do so only by special authorization. Probably this would also have been the ruling under the rabbinic law; but both the Talmud and the standard authorities are silent as to the conditions allowing the appointment of a subagent.For the conditions under which substitutes are allowed for delivery of bills of divorce, see Divorce. 2. The powers of an agent may be revoked at any time, and whatever he does after revocation is not binding upon the principal. However, the revocation takes effect only from the time that it is brought home either to the agent or to the person with whom he deals (compare rules in Mishnah Giṭ. iv. 1, with reference to the recalling of a bill of divorce from the hands of the messenger sent to deliver it). But when a deed of manumission is handed to an agent for delivery to the bondman, it can not be recalled; for a person may be benefited in his absence: hence, the mere delivery to the agent gives the bondman his freedom (ib. i. 6). As in the Roman and in the English-American law, the death of the principal ends at once all the powers of the agent, and the heirs are in no wise bound by what he does thereafter, nor can they benefit by his acts—such as taking possession of land or chattels—unless they adopt him as their agent (ib. ; and see Giṭ. 13a et seq.). But a request to an agent to make a gift of money to a person named is not revoked by death, it being carried out as the wish of a dying man; while a manumission under like circumstances could only take effect by delivery of the deed. The authority of a subagent is not terminated by the death of the intermediate, but only by the decease of the principal. The power of an attorney holding a harshaah to carry on an action does not lapse by the death of the principal; as he is, in form at least, an assignee and acts in his own right. 3. It is a general principle that the agent who acts outside or beyond the power given to him "does not effect anything"; in other words, his acts are void, and neither bind nor benefit his principal. In construing the powers of an agent—especially those of one who is employed to buy or sell for his principal—the first rule is that the principal is supposed to have his own profit in view when he appoints an agent, and that he says to him in effect, "I sent thee out to gain, not to lose" (Ket. 99b et passim). When the agent exceeds his authority, his act is void; but this occurs only when he discloses the agency. As it is presumed that the agent is not to act so as to cause a loss to his principal, a transaction negotiated by an agent may be set aside if the other party to it be guilty of "overreaching," even though to an amount less than one-sixth of the value, which is the limit allowed between parties dealing with each other in person, and though the purchase or sale be of land or of a bond, to which the law on overreaching does not apply. But the principal is protected in this way only when those dealing with the agent are apprised of his character. When one is entrusted with his principal's money or goods, and deals with them as with his own without disclosing his principal, the person dealing with him has the same rights as if he dealt with the principal; and if the agent exceeds his authority, or disregards the implied limitation not to involve his principal in losses, the latter must look to the agent alone for redress (Maimonides, "Yad ha-Ḥazaḳah, Hilkot Sheluḥin," ii. 4). Any one appointing an agent may confer upon him wider powers, agreeing beforehand to any transactions into which he may enter; in this case the principal is bound by all the bargains which the agent may make, whether good or bad (ib. i. 3). Among later casuists the opinion gained ground that one who has dealt with an agent may, in a dispute with the principal, claim that he has given to the agent this wider authority; and the principal will have to bring witnesses to the contrary, if he wishes to be relieved of the agent's bad bargain ("Ḥoshen Mishpaṭ," §§ 182-184). 4. No distinction seems to be made between paid and unpaid agents in their duty of protecting faithfully the interests of the principal. Thus, when an agent is entrusted with money to purchase land, it is understood that such a purchase must be accompanied by the usual warranty of title (aḥarayut); if he buys without a warranty deed, his principal, if he desires to keep the land, may insist on the agent's first taking it in his own name and then conveying it with his own warranty (Maimonides, l.c. i. 3, derived from B. B. 169b). In cases where an agent is sent out to buy an article of known fixed price, and the seller supplies him with a greater quantity, the excess is divided between principal and agent; where the price is not fixed, the whole excess goes to the principal. If an agent is entrusted with money to buy certain goods and he buys them for himself, he must surrender them; but when ordered to buy land and goods, if he puts his principal's money aside, and buys with his own money, he is considered a swindler, but no redress can be obtained. Such an act may even be blameless if the seller happens to dislike the principal, and is unwilling to sell to him, but is willing to deal with the agent. If an agent sent out to buy wheat buys barley, or vice versa, the principal may claim the profit if there be any, but he is permitted to throw the loss on the agent. A factor who has bought goods for his principal and stores them carelessly, so that they are injured by dampness, etc., is liable for the resultant loss ("Ḥoshen Mishpaṭ," l.c.). 5. A man may betroth a woman to himself in person or by proxy through an agent; a woman may be betrothed in person or through her agent (who accepts the coin or ring or anything of value under authority from her); a father can betroth his daughter while she is a girl (between twelve and twelve and a half), either himself or through his agent (Mishnah Ḳid. ii. 1). The messenger through whom a bill of divorce is sent by the husband for delivery to the wife, or who is sent by the wife to bring or to accept it, can not properly be called an agent; but agency enters into the law of divorce very broadly in the chapters of the Talmud in Giṭṭin. For agency in divorce, see Divorce. Betrothals of either party through an agent ceased long ago among Jews. For the relation of an agent toward his principal in cases of taking possession, see Alienation. 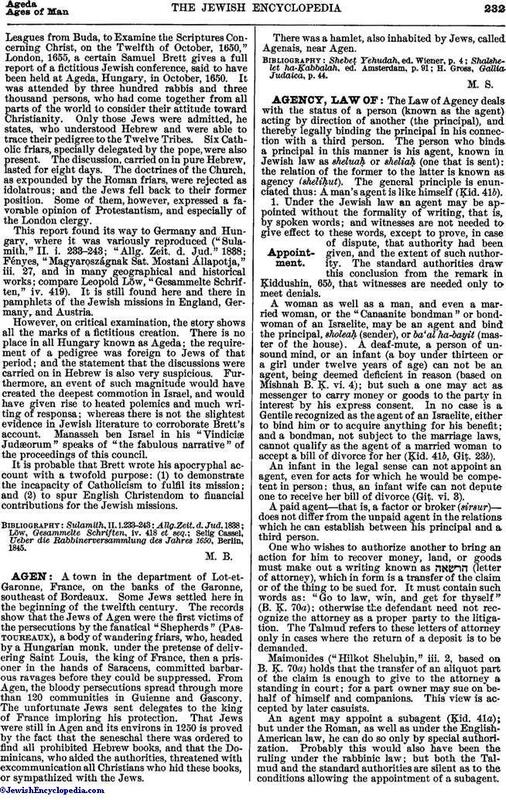 L. M. Simmons in Jew. Quart. Rev.